NEWPORT NEWS, Va., Nov. 9, 2012 (GLOBE NEWSWIRE) -- Huntington Ingalls Industries (NYSE:HII) announced today that the Virginia-class submarine Minnesota (SSN 783) was launched into the James River Nov. 3 at the company's Newport News Shipbuilding (NNS) division. "Launch is a significant accomplishment in the life of a submarine," said Jim Hughes, NNS' vice president of submarines and fleet support. 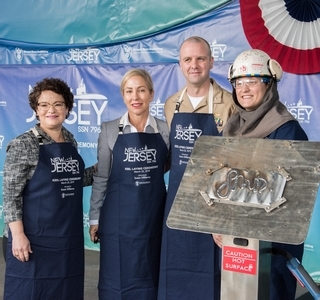 "It's an opportunity for our incredible shipbuilders to stand back and take pride in their work. Thanks to their tremendous efforts and steadfast determination, Minnesota's progress is nearly one year ahead of schedule and has been built using about 600,000 fewer man-hours than the previous boat." 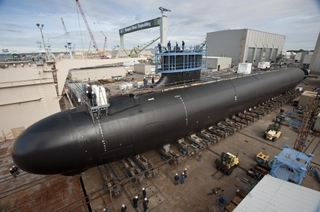 As many as 1,000 shipbuilders have worked on Minnesota, the 10thVirginia-class submarine. At about 92 percent complete, Minnesota is on track to complete in 63 months. Construction began in February 2008, and Minnesota was christened Oct. 27. To achieve her latest milestone, the 7,800-ton Minnesota was moved out of a construction facility into a floating dry dock using a transfer car system. The floating dry dock was submerged, and Minnesota was launched into the James River. Once in the water, tugboats moved the submarine to NNS' submarine pier, where final outfitting and testing will take place. "It is truly awe-inspiring having been able to watch the submarine go from pieces and now launching for the final stretch of construction prior to sea trials," said Cmdr. John Fancher, Minnesota's commanding officer. "When I think of all the energy and craftsmanship of the shipbuilders that has gotten us to this point, I am humbled. The crew is excited to get their boat into the water, and I couldn't be more proud of them and all of their hard work and training."